A group of council delivery drivers in East London are riding new £28,000 Land Rover Discovery Sport vehicles. A bit extravagant? Yes, deliberately so: these cars are testbeds for the Move UK autonomous car tech data-gathering project. Central to the project is gathering data on how autonomous cars will operate in the future. For now, the main concerns are twofold: regulation and insurance: How do we test future driverless cars to ensure they are safe, and how does the insurance industry price the risks when tables devised for humans no longer apply? “Industry faces a serious challenge in the validating of autonomous driving systems,” Bosch’s Simon Morley, the German firm’s lead project manager on the Move UK consortium, told a press briefing in Greenwich, London. He added: “Autonomy is evolutionary, not revolutionary,” which may be an attempt to sooth perceived public concern about the safety of driverless cars; various surveys of various value have shown that the public is, at best, ambivalent about driverless car tech. Move UK is currently in its first stage of testing, thanks to a £3m cash injection by Innovate UK last year. So far the test vehicles have been driven 30,000 miles around a London borough, gathering data for the project all the while. “The data collected is particularly valuable, as it is being generated through ‘real world’ driving, rather than from the test track,” said Bosch’s Arun Srinivasan, exec veep and head of mobility solutions. To that end, Bosch’s vehicle division, along with Direct Line the car insurer, the Transport Research Laboratory (TRL) Jaguar Land Rover (JLR), and other firms have formed a consortium to investigate this, partnering with the Royal Borough of Greenwich in east London. The borough covers a mix of urban roads of varying speeds and construction quality. The six-strong Disco research fleet used by the Move UK consortium is issued to council workers who regularly drive around the borough. While largely unmodified from stock configuration – meaning the wagons are fitted with the factory-standard driver assist aids, including a 360 degree camera system – JLR engineers inserted a series of computer data loggers into the boot. 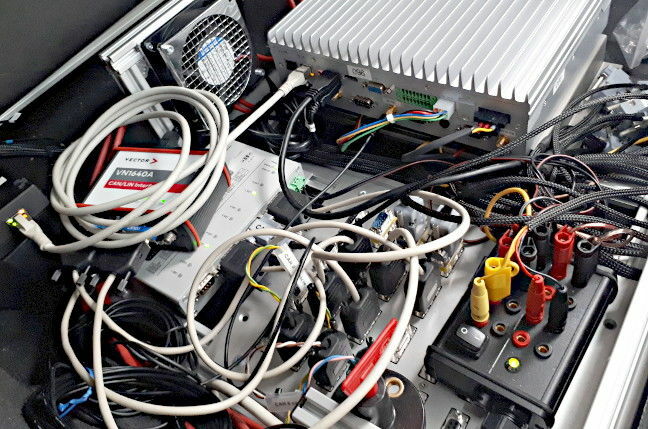 At top left is the red box which hooks the data logger gear into the car’s CAN bus (Controller Area Network). None of the sensor gear transmits data or information to the car; this is strictly a receive-only setup. The cars’ onboard systems are already capable of recognising speed signs and flashing this up on the dashboard as a little speed sign graphic. It even registered with old signs missing their customary red border, which was a good touch. The Discos log around 250 data points per second, according to the JLR rep who took your correspondent on a quick circuit around North Greenwich, near the O2 Arena. Most of this data, however, is of little use at this early stage: the idea is to concentrate on the relevant data rather than slurping the whole lot and dicing it up later on. Considering that the vehicles are capable of generating gigabytes of data within minutes, as we were told, this is a wise decision. Certain gateway events (such as passing a traffic sign) have been written into the logging software, with a few seconds of data before and after each trigger event being retained for analysis. As part of the data-slurping system, each Disco also runs a separate driverless car software suite that responds appropriately to the car’s sensor inputs. Although its outputs are disconnected, they are logged: analysts can then compare the software’s responses to real-world stimuli to what the driver himself actually did.